Between the Alps and the Po Valley, about 65 m above sea level, the lake is located in the north in the region of Trentino-Alto Adige, in the west of Lombardy, in Eastern Veneto. Thus, the three provinces Trentino share (north), Verona (east) and Brescia (west) management. 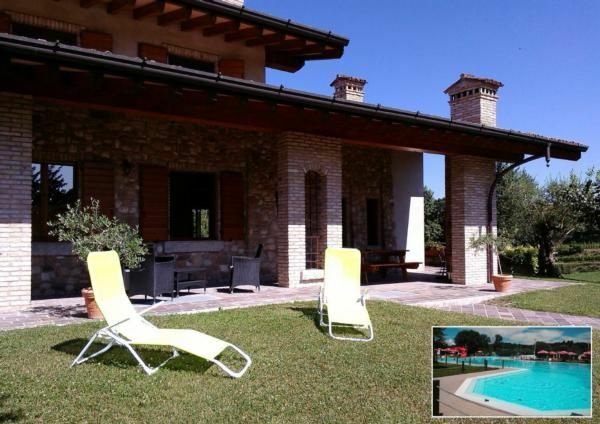 It is a secluded villa in Castellaro Lagusello, on the moraine hills situated about 12 km. south of Peschiera on Lake Garda. The house is 280 m² large, has a 1 500 m² of private grounds, incl. Garden 650 m², and consists of a wide living room with kitchen, 4 bedrooms, 3 bathrooms including 1x with whirlpool, a hobby room, large garage for 2 cars, plus car outdoor parking spaces. The holiday home offers a total of 7 comfortable sleeping places for adults and is particularly suitable for travel groups, such as 2 families with 1-2 children each. Please note: the villa does not have a swimming pool, but a famous water park is in the immediate vicinity, about 4 km away. Our guests have free entrance tickets !! Bread service (fresh bread) is also available daily and free of charge! IMPORTANT NOTE: tourist with motorboat beware! Free trailer parking space in the courtyard in front of the garage + buoy right on the harbor in Pacengo in Lazise, ​​about 15 km from the house! Bread service (fresh bread every morning) inclusive inclusive. Our guests have a daily discount of -10% on all food and drinks from the restaurant Pizzeria "La Pesa", about 50 meters from the house. For holidaymakers with motorboat: Free trailer parking space in the courtyard in front of the garage + buoy right on the harbor in Pacengo at Lazise (about 15 km from the house). SEESTRAND (stone beach): approx. 13,0 km. SAFARI PARK NATURA VIVA 20 Km. THERMAL PARK in Cola in LAZISE 18 Km. AQUAPARK "CANEVA" in Lazise 20 Km. Affi / Lake Garda South on the A22: about 30 Km. Peschiera del Garda on the A4: about 15 Km. Brescia / Montichiari 40 Km. Final cleaning: once per object costs in the amount of 90 EUR (obligatory). Lump sum: per object and day costs in the amount of 40 EUR (compulsory). Bed linen: to rent per object per week for 10 EUR (optional). Towels: to rent per object per week for 10 EUR (optional). Cot: to rent per object per week for 10 EUR (optional). A very nice welcome and beautiful surprises await you in this luxurious house combining modernity and modern domotics. Very good situation also because it is very fast to find the important tourist points of this region while staying in a nice and quiet village. we recommend. Linen (per property per day, included in the price 10 EUR). Towels (per property per day, included in the price 10 EUR). Cot (per property per week, the tenant bring 10 EUR).